To get into the spirit of Toasting Marshmallows, I arrive in the library decked out in my camping clothes — jeans and flannel shirt, hiking boots, hat — and various camping gear — daypack, sleeping bag, flashlight and guitar. I turn off the lights, and as I start setting up my stuff, I ask the kids: Where is your camping gear? Didn't you know we're going camping today? Then I ask the students what things they enjoy about camping and write down their ideas on the board. With Toasting Marshmallows standing up next to me, of course they mention marshmallows right away. Other frequent responses range from sleeping in a tent, fishing, hiking, and listening to night sounds. I then read poems from the book which correspond to the things they mention. Before I read the flashlight poems, I turn mine on, shine it around the room, and ask the children to say what the beam reminds them of. After we get past laser beams and the sun, they start realizing that the beam is round and list quite a few round things including the world, pizza, and an eyeball. Then I say, "Let's see what Kristine George thinks the flashlight beam reminds her of." They don't know we are talking about metaphors, but we are! After reading after one of the poems about night or campfire, I pull out my guitar and we sing "This Land is Your Land." The choice of camping songs is endless, and it's okay to sing without a guitar or even along with a CD*. Once we "return" to the library after our camping experience, the children are eager to check out poetry books, and I make sure I have pulled out a variety of choices for them to peruse. Visit Charlotte Van Ryswyk at her personal web site. 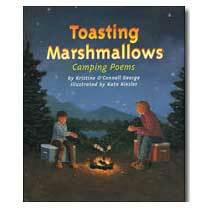 *See S'Mores for CDs with camping songs and other ideas!